Twenty five Windhoek residents, who otherwise would not have had recourse to justice, received free legal counselling earlier this month at another Free Legal Advice Day organised by the Law Society of Namibia in partnership with the Office of the Ombudsman. The event was held at the UN Plaza Community Hall in Katutura. 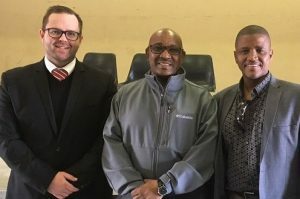 Present at the opening of the Free Legal Advice Day earlier this year in Gobabis, are from the left, Meyer van den Berg, the Law Society’s Chairperson, Ignatius Thudinyane, the Chief Executive of the Gobabis Municipality and Hendrik Mauyoma of the Office of the Ombudsman. The Law Society said the free legal advice project is part of their objectives to make legal services more accessible to those members of the public who are not in a position to afford a formal lawyer. The project was started in 2014 and has proven to be immensely popular with the public, particularly in rural towns. Since its inception, the project has been actively supported by the Office of the Ombudsman. The most common matters for which members of the public seek advice revolve around labour issues, domestic violence, inheritances, divorce and maintenance for underage children. The previous days for this year were held in Otjiwarongo, Rehoboth, Ongwediva and Gobabis which also coincided with the Law Society’s circle meeting for lawyers practising in Gobabis. This month’s Windhoek Free Legal Advice Day was the fifth so far this year, already matching the record number of days conducted last year. The sixth and last Free Legal Advice Day for this year is scheduled for 28 September in Walvis Bay. Attending to the legal needs of the public at the Windhoek Free Legal Advice Day, from the left, Appolos Shimakeleni, a Law Society Councillor, Ruben Sheehama, the City Councillor for Katutura East, George Trepper of the Khomas Regional Council, Eileen Rakow of the Office of the Ombudsman and Her Worship Tekla Nwanga, the Deputy Mayor of Windhoek.